In a judgment dated 12 May 1998 – 312 O 85/98 – “Liability for Links” the Landgericht (LG) Hamburg, Germany decided that by adding a link, the website owner may be responsible for the linked content. This can – so the LG – only be prevented by explicitly distancing oneself from these contents. We hereby distance ourselves from all contents of all linked pages on our website, and we do not make these contents our own. This declaration applies to all links on this website. The information provided on this web site has been carefully checked and is updated regularly. However, no guarantee can be given that all information is always complete, accurate and up to date. This particularly applies to all connections (“links”) to other web sites that are referred to directly or indirectly. All information may be updated/removed/changed without prior notice. Kindly clear your browsers cache on a regular basis, to ensure you see the pages up to date. 1. RV - best Female with 12 prices, 2., 3., 4., 5., 6.- RV-best Female with 11 prices and 7. RV –best Female with 10 prices. 1. RV-best AS-Female with 11 prices and 968.87 As-Points. Race Orleans 518 kilometers, 274 pigeons: 1., 11., 12., 13., 14., 16., 17., 21., 24.; 9 prices with 10 Youngsters. Epehy 283 kilometers, 516 pigeons: 1., 2., 7., 10., 13., 17., 18., 21., 21., 28.; 14 prices with 16 Youngsters. Pommereul 219 kilometers, 535 pigeons: 1., 2., 16., 32., 33.; 12 prices with 16 Youngsters. Lessines 196 kilometers, 811 pigeons: 2., 6., 23., 29., 33., 34., 37.; 15 prices with 16 Youngsters. Tessenderloo 98km, 413 pigeons: 1., 2., 3., 4., 5., 6., 7., 8., 9., 10., 11., 12., 13., 14., 15. price, etc. After the 6th flight the program pigeons were sold. In 2012 we changed our system over to long distance races. 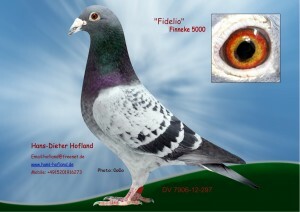 We bought pigeons from th german champion of long distamce 2010 Ulli Devers (who unfortunately passed away meanwhile). We own offsprings of his best breeders and racing pigeons.